Do you long to be in the presence of God, to know and trust that He is near? To discover fullness in the places we define as empty? If you answered yes, join us in September as we look at what God’s word ensures His children in Matthew 28:20, “I am with you always”. Well into my Christain walk I noticed that the more time I spent getting to know God, the more aware I was of His presence. Unlike in my earlier walk with Him, this no longer scared me, in fact, I wanted desperately to be more aware of Him and all that He offers his children. Becoming more aware of God has helped me discover my purpose. “In the morning when I rise, give me Jesus” is the sentiment of a hymn and the desire of my heart. I long to be in the presence of God. One day in heaven, yes, but also daily. There is so much goodness to be found in His presence. Strength, hope, acceptance, forgiveness, courage, rest, grace, peace, and on and on. In His presence there is God and God will leave you in awe and wonder. 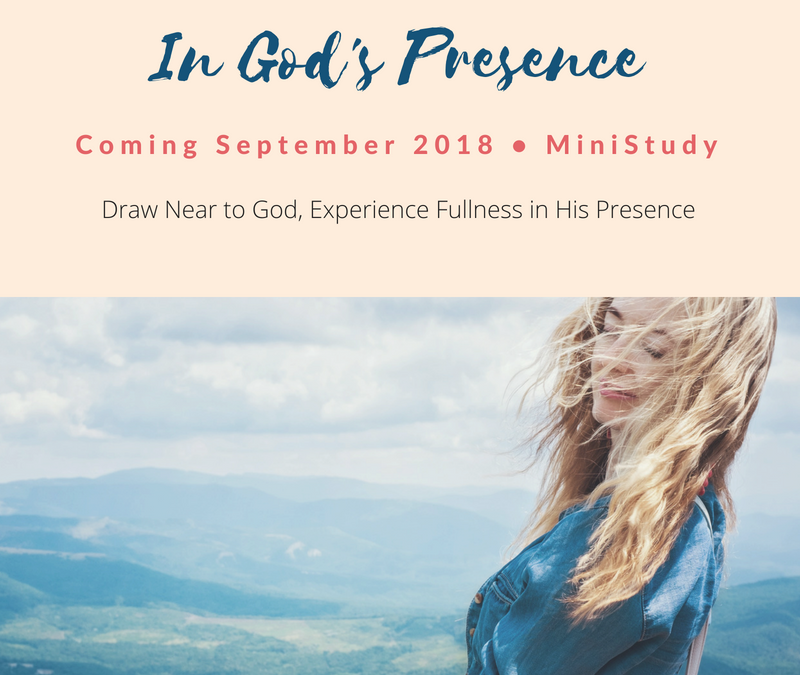 Our newest study, In God’s Presence, was birthed from this desire to draw near to God, to be more aware of His presence, and all that is found in Him. Not just for myself and the writers of this study, but for every heart that will take time to read, pray, and seek the fullness found in our Creator, the one who is near and far. The Psalmist proclaims, “My soul thirsts for God, for the living God. When can I go and meet with God” (Psalm 42:2). Each weekday we will begin with a scripture reading, devotional, and thought questions to guide us. The study is free and will be located here on our blog and on our Facebook Page. No messy sign-ups, no books to buy. Just grab your bible and a notebook and meet us each morning beginning September 3rd. Our posts come up by 6:30 am EST.